Stiga Synergy Table Tennis Table - Model T8690 - 5/8 inch Black Top. 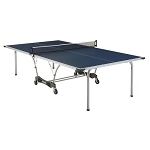 Price includes shipping for this tennis table when shipping to the lower 48 United States. Get your ping-pong game on with this Stiga table tennis table. The Synergy model features a hefty 5/8 inch black top and is supported by a 2 inch steel apron. Easily set up and take down this tennis table into storage using the deluxe folding mechanism that glides with our touch. Easily move the system to the desired location on 3 inch casters on the Synergy table. Table top thickness: 5/8 inch. Table top unfolded dimensions: 108 inches L x 60 inches W x 30 inches H.
Playback table dimensions: 68 inches x 60 inches x 62 inches. Folded dimensions: 30 inches x 60 inches x 62 inches. Comes with molded corner protection pads. Profession edge banding and striping for optimal play experience. 1 3/4 inch self-opening legs. 3 inch Mag Ball-bearing wheel casters with locks. Wooden bottom board cross brace for added table top support. Product shipping weight: 195 lbs. Product shipping dimensions: 62.25 inches x 57.00 inches x 7.75 inches. Tennis Table assembled weight: 145.00 lbs. 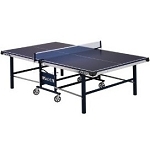 Table Tennis Table assembled dimensions: 108 inches x 60 inches x 30 inches. Ships from the warehouse in San Diego, CA. Delivery is a curbside delivery that requires the customer to be present to sign for the delivery and help unload the product. Driver will not assist with bringing the product anywhere on the property. 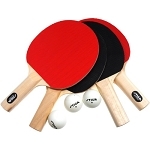 What is the difference between the T8690 and T8612 Table Tennis Tables? These two table have very similar designs and features. The major differences between them is the thickness of the table top, which is the 5/8 inch thick on the T8690 and 1/2 inch thick on the T8612. The steel apron around the table is 1.25 inches on the T8612 and 2 inches on the Top 4. Q: Does this table come with paddles? Fast Shipping: This item generally leave the warehouse within 1-2 business days. Accurate Tracking: Tracking information is updated or emailed to you after the order ships out. Delivery Details: This product ships directly from the factory in Evansville, IN. Delivery of this product is via a curbside delivery through an LTL carrier (too big for UPS and FedEx). The customer must be present to sign for the order. The freight carrier is instructed to contact you prior to delivery to set up a delivery appointment. Signing for the Package: When signing for the delivery it is important to note any damage. Damage is extremely rare. These items are packaged to travel both domestically and internationally. However, sometimes the packaging may be slightly damaged, but you may not be sure whether something inside is damaged. In such a case it is a good idea to sign for it and have the driver note it as such. You can still accept delivery. Call or email us with any questions. Local Pickup Option: This item is available for local pickup in Evansville, IN. If you are interested in picking it up locally contact our customer service for a special pickup quote at 866-308-5484. Dimensions: 62" x 57" x 8"